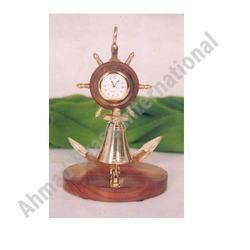 We are manufacturer & exporter of brass nautical clocks. we are Manufacturers & Exporters of Nautical item. This is one from the wide range of Antique Replicas. Which is also known as anchor clock in various face diameters. This is made of highly polished seasoned wood/nickel/brass. Best quality needles used for the hands, Well polished dials. We are engaged in the manufacturing, exporting and supplying of different types of brass vintage Hardwood Nautical Anchor Clock thermometer plaque with excellent working. - High Quality of solid brassclock. - Thermometer with beveled glass, mounted on handsome look. - Perfect an antique finish. 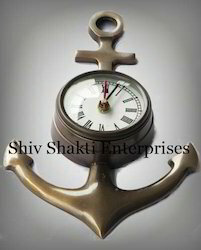 This is a very beautiful shiny polished anchor clock, and you can also hang this clock. Add an incredible appeal to your home with this designer table clock. This Creatively designed, anchor- styled table clock is a worthy buy. It could be a perfect gift for your loved ones who appreciate the modern artworks or a latest addition to your collection to enhance your room interiors. A very elegant clock for everyone's home.